Every change of season brings its own potential risks and issues, especially for New Bedford pet owners. When you think about the months that encompass spring, which can include April, May, and June, we most often think about spring cleaning projects, gardening, and holiday egg hunts or other celebrations. Unfortunately, there are hazards for pets associated with each of these springtime events. It is important for pet owners to pay attention to seasonal pet tips and bring their pet into the local Dartmouth animal hospital for a checkup or emergency services with a trusted South Coast veterinarian if they suspect their pet may have gotten into something that they shouldn’t. However, prevention IS the best solution. Take care to keep dangerous items up and away from your pet’s reach to prevent illness, injury – or worse. About the time that the bulbs begin to poke up out of the dirt, your mind is likely already thinking about getting out in the garden to start planting some new plants to enjoy throughout the spring and summer months. There are many flowers and plants that can be toxic to cats and dogs. One way to avoid your pet from having contact with them is to skip these varieties altogether. However, if your dog stays in your backyard and never goes out in the front, you can also limit them to the front yard and just remember to keep your pets away from them. Indoor cats should not be exposed to toxic outdoor plants, but there are indoor plants that you should be aware of and keep away from kitty just the same. If your pet licks, bites, or otherwise ingests leaves, petals or any other part of a toxic plant, make sure to bring them in to see the South Coast veterinarian right away. In addition to plants, there are also other hazards in the garden, including potting soil mix, fertilizers, weed killer, grass seeds, and sharp gardening tools. Make sure to keep all of these items up where your pet cannot reach them to avoid poisoning or injury. If you have a locked shed where you can keep them, along with other pest control and potentially dangerous products or tools, you should definitely take advantage of it. 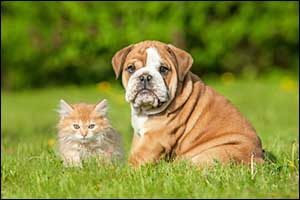 This is the best way to prevent your pet from becoming injured by the things we use to keep our gardens and landscaping looking great in the spring and summer months. One of the biggest spring celebrations is Easter. The first things we think about with this holiday include candy, eggs, toys, and lots of kids. Easter baskets contain plastic grass and other decorations, which can cause obstructive digestive tracts in cats and dogs, leading to severe dehydration and vomiting. Easter flowers often include lilies, which are fatal to cats. Chocolate, the most popular type of candy given at this holiday, is toxic to both cats and dogs. New Bedford pet owners need to be diligent around this particular holiday, making alternate choices for Easter baskets or making sure that they stay up and away from the reach of all pets. Again, if you suspect that your pet has ingested any of these items, bring them to your South Coast veterinarian right away without delay. Opening the house up to get that first smell of springtime after being stuck indoors is just as much fun for cats and dogs as it is for their humans. Make sure to use pet-safe screening on your windows, which is thicker, stronger, and more sturdy to keep your pets in and other animals out. When cleaning your home, make sure to keep cleaning supplies and other chemicals away from your pets. Consider shutting them in a bedroom while you scrub down the rest of the house to keep them safe. If you will be painting or doing any other type of home improvement during this time, you should also consider keeping them in one room or using crates during this time. Remember that paint odors can be toxic as well, however, there are brands that are safe for kids and pets that do not emit harmful chemicals even when wet. No matter what the season, it pays to learn all you can about the various hazards and toxic items found in the average home so you can keep your pet safe. New Bedford pet owners can also speak with their veterinarian at regular checkups at the local Dartmouth animal hospital. In addition, if you ever have a question, just call Anchor Animal Hospital at 508-996-3731 to speak with a South Coast veterinarian or vet staff. In addition to check-ups and vaccinations, we are also an emergency veterinary clinic, so if you suspect that your pet may have ingested something or was otherwise injured, you can always bring them in to be seen right away without an appointment.